Which Anniversary model is right for me? I’ve been in love with the 2 tone green anniversary since I started playing guitar in 2006. Recently I got a little surprise cash! Time to make my dream a reality! 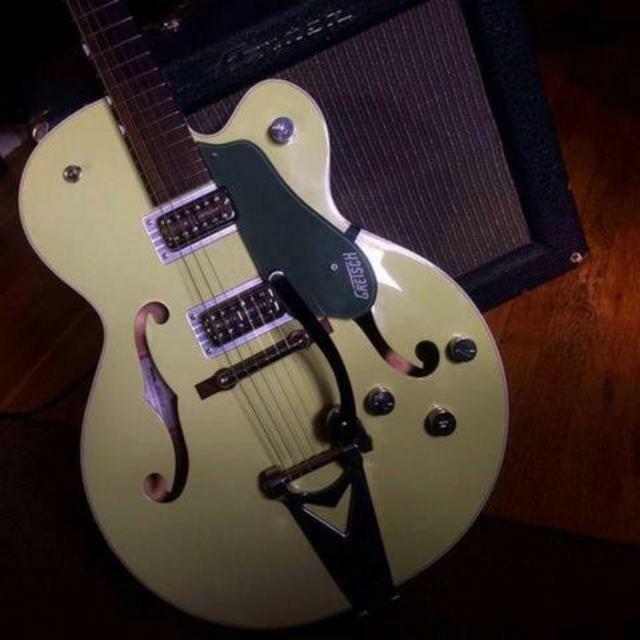 My question is, if I want a dual anniversary, two tone green, with bigsby, and Original thickness (I hate thinline guitars), what are the reissue models that I should be looking for? Tone control instead of mud switch. Pinless bigsby Rocking bar bridge (the best with Bigsby vibratos) Locking Schaller tuners (these are great with the Bigsby) PIO caps No load tone pot Treble bleed on the master volume (took me a while to warm up to this feature). What are the thicknesses that the anni has come in over the years? I've used an older (64) completely hollow double anniversary in a very loud distorted setting and I didn't have feedback problems. I had to get right up to the amp to get feedback. (When I wanted it) There all pretty cool. Vintage ones are great too and probably similar in price if you are buying new. However if I was to buy a modern one I would buy used and save a bunch of money. Keep in mind any hollowbody with serious internal top to back bracing is more like a solid body with hollowbody looks. Cool, if that's what you want and or are used to. I respectfully disagree with this post. I have my Player's Edition Anniversary and my DuoJet with the same exact pickups (and Bigsbys and Bar bridges), and the Anniversary sounds considerably more hollow then the chambered DuoJet, and nothing like a solid body guitar. Everytime I see a post where someone says the ML Bracing kills the resonance of the hollowbody I just roll my eyes. The Anniversary still feeds back, but musically with the back and top resonating sympathetically, nothing like the low-end runaway the original Anny gave me problems with. And I've had my share of Gibson hollows and semi-hollows (still own a few), and I just love the way the Anny handles high volume. I do agree with your statement of buying used though, I got my Anny for a little over $1500 buying used on ebay and it was pretty much new! Possibly from out of left field, I suggest the now-discontinued but modern-era Anniversary Jr. Best of all worlds in size, body depth, resonance, tractability. A severely wonderful guitar which for years has utterly scratched my Anni itch. Nice looking collection Tim. That big CC looks like a fun ride and looks great in that color! Funny thing, when I was looking for an new Anni, I couldn't find any of the Jr models used, but there's two of them on Reverb right now!!! The Country Club is pretty majestic, yessir. Both of the Juniors on Reverb are being sold by the same guy. Clearly different guitars - or at least they have different bridges. His descriptions offer no explanation of how he happens to have twins for sale. But I guess if you got tired of one, you'd get tired of the other one at the same time. I'm nothing like tired of mine, though. TV MagnaTron at the neck and a Classic Plus at the bridge. Here are the Reverb offerings. Yes, Koch is a brain-melter. Dude's a geyser of licks, wit, humor, personality. Larger than life. You dare not try to eat a meal with him. You'll end up squirting your drink out your nose. I love when he says " I'm going to go to the Affirm Financing web page, and affirm the sh*t out of this thing"I almost spit my coffee on that one. I have to admit anytime I see someone saying top to back bracing (like ML bracing or trestle) doesn't kill acoustic resonance I just roll my eyes ,as that's exactly what it's intended to do. control is one thing, kill is another! I agree Tim. I have a 2009 version 6118T-JR and it's one of the most responsive Gretsch guitars I own. It has a very thin top and feels alive in my hands. The Fuji-Gen built Annies are very close to vintage specs; light and resonant. The neck angle is a bit shallow though, and can present problems with bridge pickup height. I recently sold mine, but it was replaced with a 1960 Annie with trestle bracing; I'm loving it. Another one that I really liked, not green though, is the 120th Anniversary. It had TV Jones Classics, a slim, soft V neck. It really sounded nice. I've had quite a few and liked them all, but my least favorite was the Players Edition; just personal preference I guess. The 125th is a great instrument if you like TV Jones Power'trons, again, not green though. Like I said, they're all really good; hopefully you can play a few before deciding. How do I know if the Annie is a Fuji-gen annie? I think it all depends on what turns your screws..... What is your Chinese Zodiac sign? That said, I wouldn't worry about it. It's not like the Fuji ones are better than the Terada ones, they're just slightly different. If it were me, and my main thing was that I wanted the two-tone green, I'd just go get a nice used example from around 04-05, which would be the oldest (and cheapest) timeframe that you'd be sure all of the Fender-era improvements are in place (alnico Filters, 3-ply top, etc). The JF Annies haven’t been built in quite a while. I think all full size JT Annies since around 2007(?) have trestle or ML bracing. Now that I am listening to more Gretschs, I am afraid my sign might be falcon or penguin . Honestly, I’m in trouble. I am starting to think about a country Club or a 6120 instead. "Honestly, I’m in trouble. I am starting to think about a country Club or a 6120 instead"
Sonically, the 6120 and the Anni can be twins - depending on how they’re spec’ed. The 6120 has come in more variations - combinations of pickups, bracing, and control schemes - than the Anni. But two examples with similar spec will sound no different from each other than two of the same model. Cosmetics and trim differ, but both are 16” 24.6”-scale archtops. A Country Club and a Falcon are twins of the 17” 25.5”-scale variety. Both have likewise come in a range of pickup/bracing/control schemes - and, again, similarly equipped and built, they’ll sound the same. Again, the differences are cosmetics and trim. I’m not discounting the importance of appearance, vibe, and even artist association in picking a guitar. But the Gretsch line can dazzle and overwhelm, so it helps to get analytical about the bones within the gorgeous skins. Having been through the process and come out the other end with a fair number of reasonably careful choices which cover the Gretsch spectrum with minimal functional duplication, I would suggest that, among the full-deep archtops, the two most sonically significant factors are body size/scale length and pickups. To end up happy out of the gate, you really have to get familiar with the tone and application of both Filter’Trons and Dynasonics (which are very different in sound and response). You can do that by listening to a lot of demos and recordings. Body size/scale length have an impact on sound, of course - but to really appreciate how the two sizes feel to hold and play...you’ll have to hold them and play them in person. Nother words, the choice between a 6120 and an Anni is not a big one functionally - but between either of those and a Club or a Falcon is much more significant. You gots some homework to do, and unless you’re buying a guitar as artwork and not a musical instrument, you can’t make the decision on appearance. I agree with Proteus. Many guitars in the Gretsch line are very similar in tone. The bling factor comes into play on most choices. I’d first narrow it down to hollow body vs Duo-Jet/Penguin. Then decide on pickup choice. Size, look and feel might be the most important. My first Gretsch was my 125th Jag Tan Annie. I liked the look and idea of an “understated 6120” didn’t get along with the bridge or pickups and swapping them for something different. Decided the top was a little too plain for me so I had it pin stripped. It’s been my number 1 guitar for many years now. Decided I was ready for some serious “bling” on stage and went for a White Penguin, love the look not such a fan of Dynasonic pickups, swapped em out. Now I’m trying to get aquatinted to its smaller size.... oh and it’s impossible to see side fret markers. In the end, I’m not sure there is the “perfect” guitar choice. So find one that flips your switch in some way and go for it!